Tips and Tricks for Debugging an Electron Application is an excerpt from Electron in Action, a step-by-step guide to building desktop applications that run on Windows, OSX, and Linux. If you’d like a refresher on Electron, then check out our tutorial: Create Cross-Platform Desktop Node Apps with Electron. Imagine you have a new, shiny Electron app. Everything is going smoothly for you, but it probably won’t be long before you need to debug some tricky situation. Being that Electron applications are based on Chrome, it’s no surprise that we’ve access to the Chrome Developer Tools when building Electron applications. 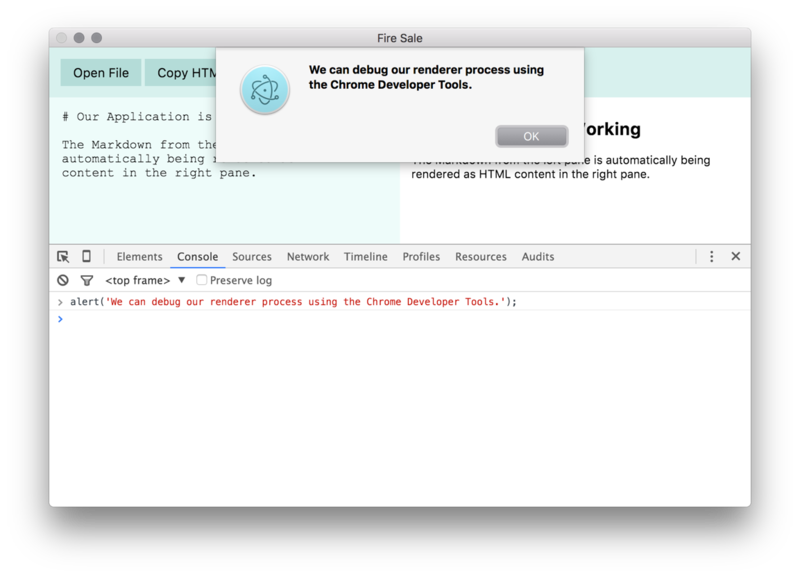 Figure 1: The Chrome Developer Tools are available to us in the renderer process like they’d be in a browser-based application. Debugging the renderer process is relatively straight-forward. Electron’s default application menu provides a command for opening the Chrome Developer Tools in our application. You can create your own custom menu and eliminate this feature in the event that you’d prefer not to expose it your users. Figure 2: Figure 2 The tools can be toggled on and off in the default menu provided by Electron. Developer Tools can be accessed in two other ways. At any point, you can press Cmd + Opt + I on macOS or Ctrl + Shift + I on Windows or Linux. In addition, you can also trigger the Developer Tools programmatically. The webContents property on BrowserWindow instances has a method called openDevTools(). This method, as you might as expect, opens the Developer Tools in the BrowserWindow it’s called on. We can programmatically trigger the opening of the Developer Tools on the main window once it loads. Debugging the main process isn’t easy. Node Inspector, a common tool for debugging Node.js applications, isn’t fully supported by Electron. You can start your Electron application in debug mode using the --debug flag, which will—by default—enable remote debugging on port 5858. Limited support for using Node Inspector with Electron is available in the official documentation. As this is still somewhat in flux, you should review the most recent version of the documentation if you aren’t using Visual Studio Code. Be warned: Your mileage may vary! 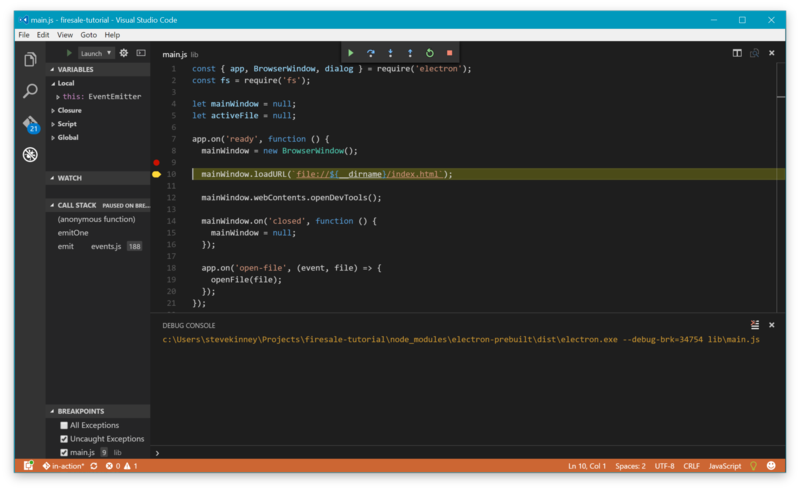 Visual Studio Code is a free, open-source IDE available for Windows, Linux, and macOS and has been—coincidentally—built on top of Electron by Microsoft. Visual Studio Code comes with a rich set of tools for debugging Node applications, which makes it easier to debug Electron applications. A quick way to set up a build task is to ask Visual Studio Code to build the application without a build task. Press Ctrl + Shift + B on Windows or Command + Shift + B on macOS and you’ll be prompted to create a build task as show in Figure 3. Figure 3 Triggering the build task without one in place will prompt Visual Studio Code to create one on your behalf. Alternatively you can press Ctrl + Shift + P to open the Command Palette and type “Task”. Then select Select Tasks: Configure Task Runner, which will create a tasks.json file under a folder named .vscode and open it. Setting up the build and debugging tasks are similar on each platform, with one important distinction in how electron-prebuilt names the prebuilt binary for each operating system. On Windows, the binary is named electron.exe, on macOS, the binary is named Electron.app and on Linux it’s just electron. Be sure to replace <name-of-binary> with the appropriate name for your system. Now, when you press Ctrl + Shift + B on Windows/Linux or Cmd + Shift + B on macOS, your Electron application will start up. Not only is this important to set up debugging within Visual Studio Code, it’s also a convenient way to start up the application in general. The next step is to set up Visual Studio Code to be able to launch the application and connect to its built-in debugger. Figure 4: Inside the Debugger pane, click on the gear and Visual Studio Code will create a configuration file for launching the debugger on your behalf. To create a launch task, go the Debugger tab in the left panel and click on the small gear (figure 4). Visual Studio Code will ask you what kind of configuration file you’d like to create. Select Node.js and replace the contents of the file with the example configuration below. You can read more about launch configurations here. With these two configuration files in place, you can click on the left margin of any line in your main process to set a breakpoint and then press F5 to run the application. Execution will pause at the breakpoint, allowing you to inspect the call stack, see which variables are in scope, and interact with a live console. Breakpoints aren’t the only way to debug your code. You can also watch for specific expressions or drop into the debugger whenever an uncaught exception is thrown. Figure 5: The debugger built in to Visual Studio code allows you to pause the execution of your application and drop in to investigate bugs. Now that you know a bit more about debugging Electron apps, go download the free first chapter of Electron in Action and see this Slideshare presentation for more details on what’s inside the book. Steve is the Director of the Front-End Engineering Program at the Turing School of Software and Design. He is also the organizer of Dinosaur.js, part of the JSConf family of events, and author of the book Electron in Action.